The identification of cells as either malignant or benign reactive mesothelial cells in serous effusions is an everyday diagnostic problem. It is mainly due to the bland morphological details of the cells, overlapping or overcrowding of cells, cell loss and changes due to the different laboratory processing methods. To evaluate the diagnostic efficacy of a combined approach of morphologic features in smears of pleural and peritoneal fluids stained by the Papanicolaou (Pap) and May Grunwald Giemsa (MGG) methods and by cell blocks prepared by a modified technique. Smears of 85 aspirated samples of pleural and ascitic fluid were examined in order to compare cellularity, crowding of cells, nuclear preservation, cytoplasmic preservation, blackground and ability to make a definite diagnosis on the specimens. All these features were assessed on 0-3+ scale and were statistically analyzed. The MGG method was found superior for cellularity, cytoplasmic preservation, background materials, ability to make a definite diagnosis and in preventing cell loss and cell crowding, while the pap method was found to be superior for nuclear preservation. The modified cell blocktechnique produced histologic sections of excellent quality. The combined method increased the diagnostic yield of malignancy from 17 to 21 and reduced the atypical cases from toto1. The sensitivity of cytodiagnosis of effusions can be significantly increased by using all the three methods on each specimen - smears processed by Pap & MGG method and cell blocks rather than by using only one of these techniques. The modified cell block technique is very simple and cost effective. Low cost technologies are being studied for control of cancer of the uterine cervix in high incidence regions and countries with limited resources. Results from two programs on ‘visual inspection’, one in a general hospital and one in the general population is discussed in the context of health care delivery and competing priorities in developing countries. The very low sensitivity and specificity of visual inspection coupled with the serious limitations in providing diagnostic and therapy services and the lack of compliance among women does not support the concept of cervical cancer control through visual inspection in developing countries. Fine needle sampling (FNS) without aspiration and fine needle aspiration (FNA) were done on 80 patients having swellings in head and neck region. All the smears obtained by both the techniques were evaluated using five objective parameters. Blood contamination was found to be less with FNS without aspiration as compared to FNA in all the cases. This difference was statistically highly significant for thyroid and lymph node (p<.01). Cellular yield was better with aspiration than in smears obtained from FNS without aspiration but the difference was statistically insignificant (p>.05). Lesser degree of cellular degeneration and trauma was observed with FNS without aspiration than with FNA. Smears obtained with former technique were superior in quality as compared to FNA smears. The overall diagnostic accuracy was 88.6% with FNS without aspiration than with FNA. Smears obtained with formertechnique were superior in quality as compared to FNA smears. The overall diagnostic accuracy was 88.6% with FNS without aspiration and 96.3% with FNA but this difference was not statistically significant (p>.05). It was found that small swellings (less than 2 cm in diameter) gave negative results more often with FNS without aspiration than larger ones. With FNS without aspiration the perception of tumour consistency was better as needle was held directly with fingers. It is more cost effective than FNA and is relatively painless and safe. To establish the importance of Charcot-Leyden Crystals (CLC) as a goodcytologicalcriterion for amoebic liver abscess, fine needle aspiration cytology (FNAC) smears of eleven cases of liver abscesses positive for CLC, were studied. 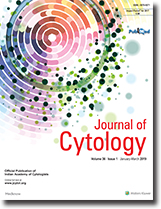 Cytological findings were co-related with clinical presentation, ultrasonographicfindings andtherapeutic response. In allelevencases presumptive diagnosis of amoebic liver abscess was made on the findings of CLC in FNAC smears. In one case amoebic tropozoites were also seen. Five cases (out of eleven) received antiamoebic therapy. Four of these cases were followed on the basis of serial ultrasound and one was followed on the basis of clinical findings. All these five cases recovered completely. Six remaining cases were lost follow-up. Since amoebic trophozoites are not so commonly found in amoebic liver abscess, presence of CLC in FNAC smears of liver abscess is a good cytological finding. This finding assumes more significance in regions where amoebic liver abscess is quite common and all the patients do not have access to expensive ELISA (Enzyme Linked Immunosorbent Assay) tests. Since CLC are well appreciated in wet films, it can be used as a simple and cheap screening procedure in busy outpatients department of a hospital. The cytological features of Papillary Solid - Cystic Epithelial Neoplasm of Pancreas (PSEN) in a 20-year-old female patient is described. The patient presented with pain abdomen and was found to have a well-defined mass localized to the region of tail of pancreas. Part of the mass was found to be adherent to the spleen. CT guided FNAC smears revealed cellular neoplasm with prominent papillary structures lined by uniform cells with bland nuclear features. Presence of a mucoid sleeve between the cells and the vascular cores of the papillae was a prominent cytologic feature. The cytological findings correlated well with the histological findings on the surgically operated specimen of distal pancreatectomy with splenectomy. The patient remained symptom-free following surgery. We present this report to highlight the difficulties encountered in diagnosing a case of renal angiomyolipoma which can mimic renal cell carcinoma radiologically and on fine needle aspiration cytology. The final diagnosis was made on histology. A case of metastatic esthesioneuroblastoma (ENB) was diagnosed on aspiration cytology of cervical lymphnode. Presence of monomorphic, small, round cells, rosette formation, overlapping of nuclei and chromatin pattern helped in reaching early diagnosis and management Long term follow up is required due to the unpredictable behaviour of tumour. Tumoral calcinosis is a relatively uncommon condition and cytomorphologic findings have not been widely published. We report four cases in which the diagnosis of tumoral calcinosis was made by FNAC. Calcific particles, chronic inflammatory cells and fibrous tissue is seen depending upon the stage of the disease.